Accessories for motorcycle helmets can make a good helmet even better. Even after you've bought a motorcycle helmet that feels great and serves you well, you might want to add a few accessories to increase your comfort and safety. Or, after you've used a helmet for a few riding seasons, you might want to -- or need to -- replace or upgrade some of its parts and pieces to extend its service life. 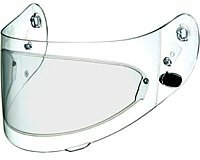 Replacement faceshields are probably the most popular accessories for motorcycle helmets. It's a good idea to carry a spare faceshield if you're heading out on a multi-day trip. In addition to being able to attach a new shield right away if your current shield catches a stone or is otherwise damaged, having a spare saves you the trouble of finding a cycle shop that carries the model you need. A helmet visor is a small motorcycle helmet accessory that will give you an extra margin of eye shade, eye protection and riding comfort. Of course, your helmet must be equipped with snaps or other attachments to accommodate a visor. 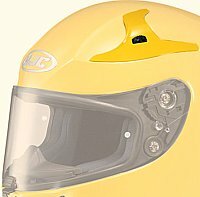 With today's sophisticated helmets -- especially full face helmets -- your faceshield rotates on a pivot/ratchet mechanism unique to your lid. While, in time, you might wear out your helmet's faceshield pivots, it's always a good to have a spare pivot/ratchet kit handy -- especially when you're on an extended cruise. You never know when you'll need to replace a damaged or lost part. Pivot kits are small and easy to tuck away on your bike. But, please remember where you put your spare. 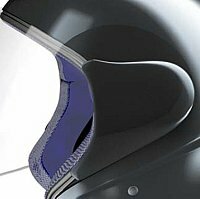 A nice feature in many helmets is the ability to change or replace the cheek pieces and other padding that protects your head and makes your helmet comfortable. You might want to replace worn pads that have lost their shape and thickness and renew your helmet's firm fit and feel. Many riders like to have a second set of fresh pads handy to install right away while the other set goes through the wash.
You can use special cleaners inside your helmet to attack bacteria and mildew that cause odors and make your helmet unpleasant to wear. Such cleaners are very helpful if you can't remove and wash your helmet's interior padding. Exterior cleaners are available to clean nasty stuff off of your faceshield without causing the shield -- over time -- to get cloudy and difficult to see through. And there are special polishes you can use to keep your helmet's fancy artwork -- or even a plain white surface -- clean and shiny. In most cases, it's best to stick with the simple, strong and easily adjustable D-ring system used to snug down the chinstrap on must helmets. However, reliable quick-release chin-strap devices are available if you'd like to give them a try. Helmet manufacturers install base plate covers/pivot cover plates primarily on full coverage helmets to protect the face shield's pivot mechanism. Unfortunately, these covers can pop off unexpectedly and get lost. And, fortunately, replacement covers are available for most helmets. 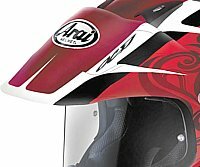 "Tear-offs" enable riders -- usually motocross riders -- to continue to see clearly through their faceshield when conditions get dirty. Riders attach a packet of thin, clear tear-offs to their helmet's faceshield so they can quickly tear away a dirty, mud-splattered strip that's clouding their view to reveal the next clean tear-off underneath. They enable you to continue riding and to see clearly when the trail gets muddy. Whether you transport your expensive, high-tech helmet in a bouncing saddlebag or under your arm; or you store your helmet in the hall closet -- it's nice to protect your investment with a sturdy helmet bag. 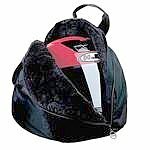 Look for a helmet bag that has a good, solid zipper and sufficient padding. And it should enable you to get your helmet in and out with ease. 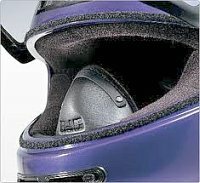 Some riders wear a breath box inside their helmet to seal the area around their noise and mouth. This motorcycle helmet accessory prevents condensation from forming on their visor, and they protect their face from extreme cold. Some breath boxes require a bit of fiddling to install, and some require a few rides to adjust and/or get use to their feel and function. Many helmets are equipped with intake and exhaust vents that -- when opened -- maintain maximum air flow through your helmet's interior. This is a particularly nice feature on hot days. If your helmet vents are damaged or worn, it's nice to be able to keep your helmet cool and airy by installing a set of replacement vents. 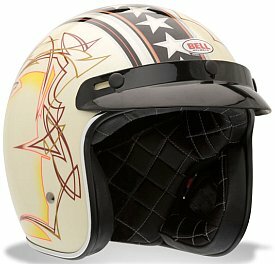 Depending upon your intended purpose and frame of mind, you can add a variety of helmet accents to your lid. Such accessories for motorcycle helmets include Mohawk haircuts, imitation saw blade teeth and metal studs. 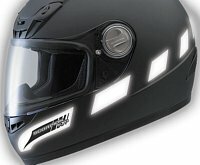 For safety purposes, you can make your helmet stand out in the dark with light-reflecting stickers, tape or attachments. 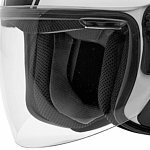 Many riders rely on anti-fog accessories to prevent moisture build-up on the inside surface of their helmet's faceshield. 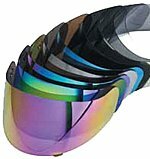 Anti-fog products include various visor inserts, lenses and inner shields. 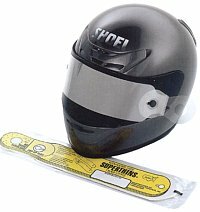 Accessories for motorcycle helmets help you to keep your helmet comfortable and in proper working order for many riding seasons. They can also add a touch of personality to this vital piece of personal riding gear. It's nice to have such a variety of accessories for motorcycle helmets to choose from.